The Judaica Sound Archives at Florida Atlantic University Libraries was delighted when our friends Josh Kun and Roger Bennett told us that they were putting together an album of Tikva Records favorites! As you may remember, the JSA provided many of the LP covers for their book, And You Shall Know Us by the Trail of Our Vinyl, which was published in November 2008. 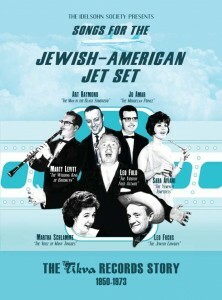 Now, as part of the Idelsohn Society, they have released the album, Songs for the Jewish-American Jet Set: The Tikva Records Story 1950-1973. To celebrate this accomplishment they have opened a 1950′s style record store right in San Francisco’s Mission District (3191 Mission Street). The store is open for business from December 1st through the end of Hanukkah (December 28). Of course, we wish them great success. So the Judaica Sound Archives sent them seven cartons of Jewish LPs (many of them on the Tikva label) to be offered at their record store. Click here to find out more about what they are doing.